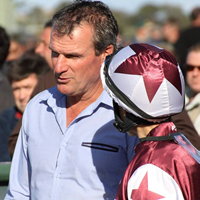 Fancy a Guided Tour of Darren Weir's Forest Lodge stables? Fancy a Guided Tour of Darren Weir’s Forest Lodge stables? Fancy taking yourself and nine lucky friends for a guided tour of the outstanding Forest Lodge stables of leading trainer Darren Weir in Ballarat? The Weir stable is a wonderful supporter of the Burrumbeet Park & Windermere Racing Club and Darren has graciously opened up his stables in December for one lucky person (and 9 friends) who purchases an Umbrella or Marquee package for the 2014 Burrumbeet Cup meeting on New Year’s Day. To be in the running, all you have to do is buy an Umbrella or Marquee package via the club’s Country Racing website before midnight November 30th 2014. >>> Click here to visit Burrumbeet Park & Windermere Racing Club website. Once your package has been purchased via the Burrumbeet Park & Windermere Racing Club website simply email club secretary Paul Brumby at burrumbeet@countryracing.com.au with your name & details to be added to the draw. The lucky winner will be drawn out by club president Rod McKinnon on Monday 1st December 2014 and contacted shortly thereafter. Grab your package to one of Western Victoria’s most iconic country race days and be in the running to visit Darren Weir’s Forest Lodge stables, home to dual Group 1 winner Trust In A Gust and flashy grey Puissance De Lune, and many more up and coming stars. The guided tour of Forest Lodge will take place in December at a date & time to be arranged by both parties and if the racing gods align, Darren Weir will take the tour himself. 1- All packages must be purchased via the Burrumbeet Park & Windermere Racing Club website at Country Racing. 2- To qualify for the draw you must purchase a package in November before the cut-off time of midnight Sunday 30th November 2014 and email club secretary Paul Brumby with your details. 3- Forest Lodge tour will be held in December 2014 at a time & date that suits all parties. Any questions at all please ask via the club’s Facebook page here.